Well, it happened. UNESCO’s World Heritage Committee, arbiters of the World Heritage Site list, met this week (as they do annually) and Liverpool was on the agenda. A decision was made to place the Maritime Mercantile City on the ‘In Danger’ list, which means that the “outstanding universal value” for which the area earned the title in 2004 (see my map of the historic sites of Liverpool for an outline of the WHS) is under threat. Well, 2012 is just getting started, but UNESCO have set off the first fireworks in this year’s battle over the north docks. After visiting the city in November, the UN inspectors are claiming that, should Peel’s plans go ahead, it would cause a “serious loss of historical authenticity“. Comments Off on UNESCO visit to Liverpool: the future vs the past? UNESCO visit to Liverpool: the future vs the past? Council Leader Joe Anderson has hit out at English Heritage for what he sees as the over-reaching influence and meddling of the ‘heritage lobbyists’ in the future development of Liverpool. Anderson’s current gripe is related to the Liverpool Waters project, which English Heritage advised to be reduced. Since their input, the number of tall buildings has been reduced, and the centrepiece Shanghai Tower moved back from the waterfront. The Daily Post has a balanced editorial stating that heritage matters should be considered hand in hand with development progress, and points out that many historic buildings have been brought back into use successfully in this and other cities. Coincidentally, part of the current Biennial art festival concentrates on the re-use of derelict buildings for public enjoyment. So, English Heritage preserve old buildings, and World Heritage Site = no magnificence, thank you very much. Looking at this from the other direction, is heritage really the stumbling block? Is the Albert Dock a less ‘magnificent’ development because of all the heritage? Or is the heritage key to its attraction? (OK, enough rhetorical questions.) The flats at the King’s Dock and in the former warehouses at the Waterloo Docks are massively successful examples of historic buildings reuse which have not harmed the historic environment. There are other developments – the very magnificent Great Court at the British Museum and World Museum Liverpool, for example – which have added modern architectural elements to historically important buildings. However, Joe Anderson shouldn’t be surprised or dismayed when ‘heritage lobbyists’ kick up a fuss about wrecking a World Heritage Site with modern ‘ego architecture‘ (subscription required) – massive developments which are all about money and prestige, and nothing about quality of life in the long run. Anderson may have a different point of view, but I don’t want Liverpool to turn into the Shanghai/New York of the West/Europe. I want Liverpool to be The Liverpool. The solution to Anderson’s problem is not to stop groups like English Heritage and the Civic Societies from airing their views. Rather it is for the architects to produce creative, attractive modern designs keeping in scale with the current landscape. Even completely new builds like Liverpool One can achieve this, and the Echo Arena for another great example: it’s unashamedly modern (and I’d say attractive), but it doesn’t try to take over the whole skyline. He said: “The Wellington Rooms, in Mount Pleasant, and other listed buildings are lying derelict because of the poor designs by the architects would have trashed the building. OK, so that’s a bit of fun, but remember: it’s not investment that English Heritage are blocking, nor development. It’s poor architecture. There’s one easy way to get development going, and that’s to design something creative, with life-span and beauty, and which adds to, and doesn’t replace, the amazing architecture we have been left by those who came before us. Note: all views in this post are my own. It seems only yesterday that I was bemoaning the uncertainty of the future for Liverpool’s built environment (oh, wait… it was). Now, on the same day that we can celebrate the historic Stanley Park and 16 other Liverpool parks getting a Green Flag award, there are confusing rumours of Peel Holdings’ plans to transform Merseyside’s docklands. 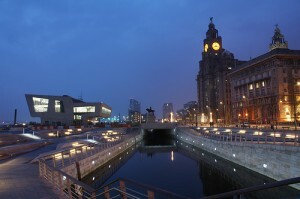 English Heritage have expressed their concern that the schemes – which originally wanted to erect dozens of skyscrapers across both waterfronts – would damage the context of the World Heritage site, centred on the Three Graces. In response, Peel have scaled back the plans, now with just two groups of tall buildings between Princes and Clarence Docks. 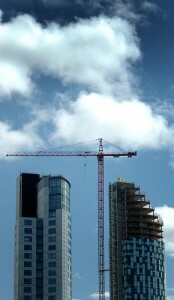 The number of tall buildings is lower than was planned in 2007, with the group at Clarence Dock being reduced from 15 to seven towers. Meanwhile however, more success for Peel over the Mersey, with the Wirral Waters project expected to be granted planning permission by councillors next week. OK, if all that was a bit much for one day, here’s a more… lovely story. We’ve moved a step closer to Peel’s vision of ‘Liverpool Waters’ with funding being secured for the 54 storey Richmond Properties/Y1 tower towards the north docks, at the junction of the Strand and Leeds Street. 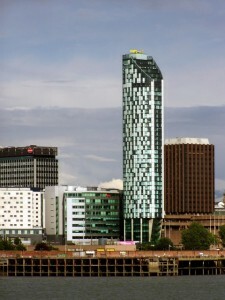 It’s 25m taller than the current tallest tower, Tower West, but has been redesigned (again) after a failed attempt at getting planning permission in 2007. Having failed to get the sleek design past the Council planning committee, it seems that the architects have thrown a bucket of Sticklebricks at the south side, to see what sticks (check out the third pic in the slideshow via the link above). Comments in the Architect’s Journal include the terms ‘pig ugly’, ‘hubris’ and ‘shoebox’ (though the third of these is a Wayne Colquhoun comment, so pinches of salt all round). Further criticism for Liverpool’s attempts at regeneration come from Colquhoun’s arch enemies, the Commission for Architecture and the Built Environment (CABE). The commission has hit out at the New Heartlands Housing Market Renewal scheme, particularly parking courts and the quality of housing. SAVE’s Will Palin added to the judgment, claiming that “swathes of good Victorian terraced housing been emptied and left to rot”, to be replaced by inferior buildings. OK, enough about planning for now. Adrian McEwen (via Twitter) pointed out the new Streets of Liverpool website. This blog brings you views of Liverpool from across the 19th and 20th Centuries, with a paragraph or two about what you can see in the photos. The February 8th post is all about Lost Churches of Liverpool, which is a kind of post-script to the 2001 book The Churches of Liverpool by David Lewis, which was published by the blog author. It’s great to see some little admissions of what the publisher would have liked to have done better in the book (an index, for example), but to make up for this (perhaps!) future blog posts will give us photos of the greatest losses to the city, starting with St George’s Church, which stood where Liverpool Castle once was, and where now we find the Victoria Monument. The most recent post as of this writing does a similar service to other lost Liverpool buildings, including arguably the most-missed: the Customs House, which was needlessly demolished in the post-Blitz redevelopment. Make sure you keep an eye on this new blog – it promises to be a good one! Peel’s Liverpool Waters scheme has reached another milestone with their plans for Birkenhead Docks being submitted to the local council. The Northbank east section has already been approved, but this East Float part is apparently the UK’s largest planning application. Peel hopes the Mersey estuary will rival Shanghai and Sydney once the development is completed, and the artists’ impressions I’ve seen certainly show a massive change from what the area looks like now. Perhaps I’m being old-fashioned, or at least conservative, but to me this will completely change the character of Liverpool and the Wirral. I’m not opposed to big cities per se, but what I love about Liverpool is the human scale of it all. 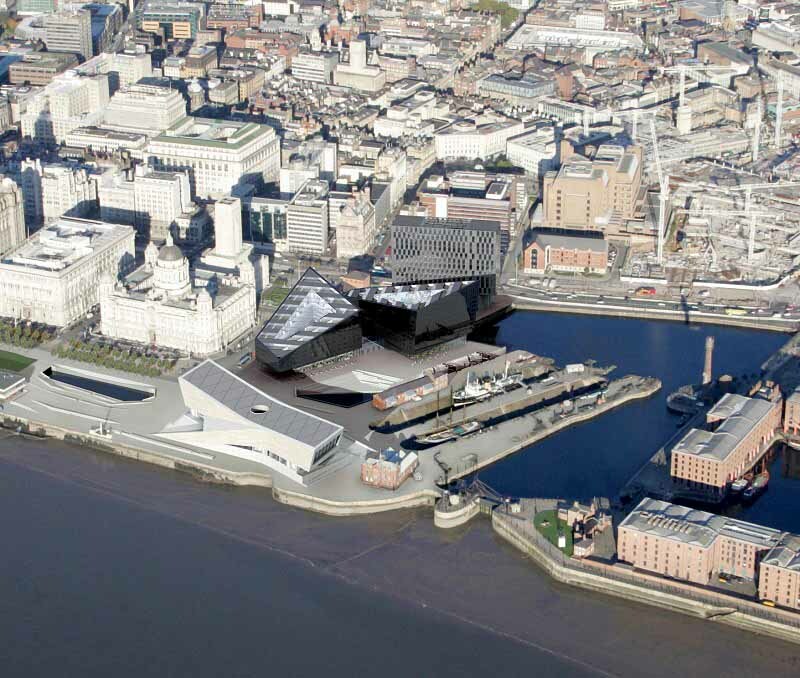 Say what you want about the Mann Island development and the new Liverpool Museum, but the size (if not the design) of these buildings fit with the character of Liverpool. So does Liverpool One. The forest of skyscrapers promised by Peel will remove that feeling, and alter the balance and focus of the river bank. No longer will the Three Graces be the prow of the good ship Liverpool. All eyes will be on Peelsville. I’d dearly love to see the vast swathes of dereliction in Liverpool and Birkenhead brought back into use (see for instance my earlier posts on Stanley Dock). But whether historic buildings are brought into use or new development takes place, I’m sure there are better, more individual ways of doing it. Discussions on Yo! Liverpool certainly show enthusiasm for the project, although there are some who want tougher questions asked. Perhaps the new version of Liverpool – Peel’s version – will be a hugely exciting place to live and work, but I fear that I’ll feel a little lost in it all. 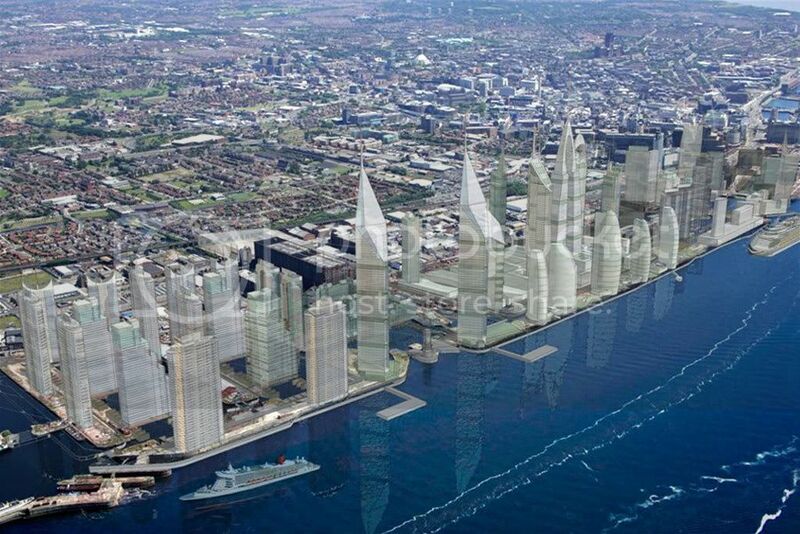 The plans concentrate in the north docks, so perhaps both towns can successfully contain their ‘scraper cities’. What do you think? Speaking of my recent Stanley Dock article, I was contacted by Peter Baines, Local Government Improvement Adviser for English Heritage, who pointed me in the direction of Liverpool City Council’s Regeneration Select Committee. Peter tells me that “these committees hold in-depth reviews on all manner of policy areas and make recommendations to the Council’s Executive / Cabinet about how things can be improved”. This page shows how open this committee is, with agendas and minutes posted for all their meetings. The page also lists their responsibilities, which to me look like exactly the kind of progress and development we should be after. Thanks, David! Good to know we have these committees! Liverpool.com has a great little article on the best pubs and bars to be found in the city centre. From the Grapes and Carnaevon Castle to the Richmond and the Globe, the list gives away some hidden gems in Liverpool’s pub landscape. Have you tried any? Liverpool Landscapes and Historic Liverpool go social! If you’re a regular reader (and if not, why not?!) then you may have noticed the headlines in the left-hand bar. These are my posts on the new Historic Liverpool Twitter page! Click straight through to the stories from this blog, or follow all the updates at @histliverpool. You can also keep an eye on all the links used in this blog by going to the Historic Liverpool Delicious page. This is a site where I can publicly bookmark interesting pages, and keep them collected in one place. Both these pages can be viewed without opening an account, and you can keep up to date with each page by adding their URLs (Delicious, Twitter) to a feed reader.